As we are out looking for antiques for our customers, we come across a lot of furniture that has been used and abused! Much of it is way past salvaging the entire piece, but we may be able to salvage some legs, metal pulls, or some unique wood designs for repurposing projects. If we are lucky, once in a great while we run across a piece that needs a good cleaning some refinishing or painting and it's ready to go. Measures 30" high x 17" wide x 30" long. This has become quite a job for us. We started out "picking" a twin headboard and footboard from a neighbor of ours...and decided to turn it into a bench. 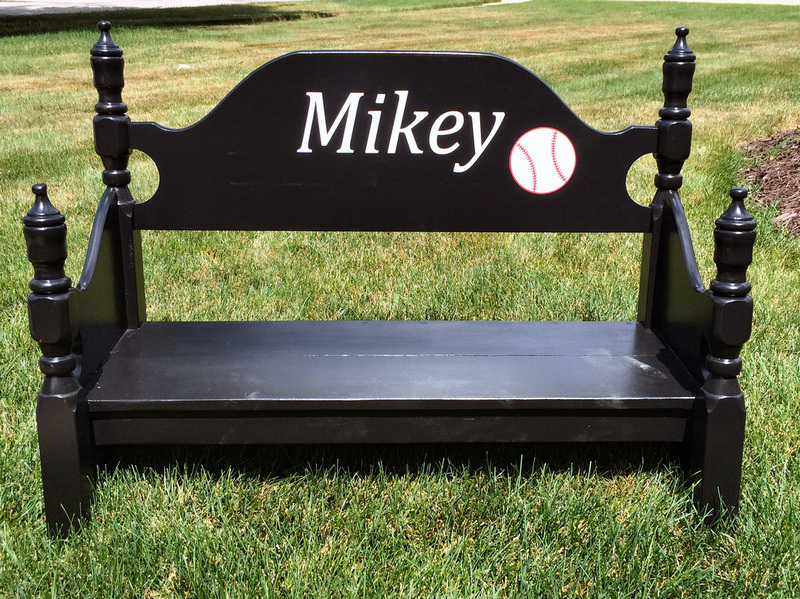 The only problem with these boards was that they were very short...so our first bench was for a little boy "Mickey". The seat bench seat was 10" off the ground. Perfect for a toddler. Since Mickey's bench, we have made numerous benches for our customers. A few of them are now bringing in their own bed sets from home and asking us to make a bench out of them...which we gladly do.